Yarrr, the perfect addition to any pirate enthusiast's collection! 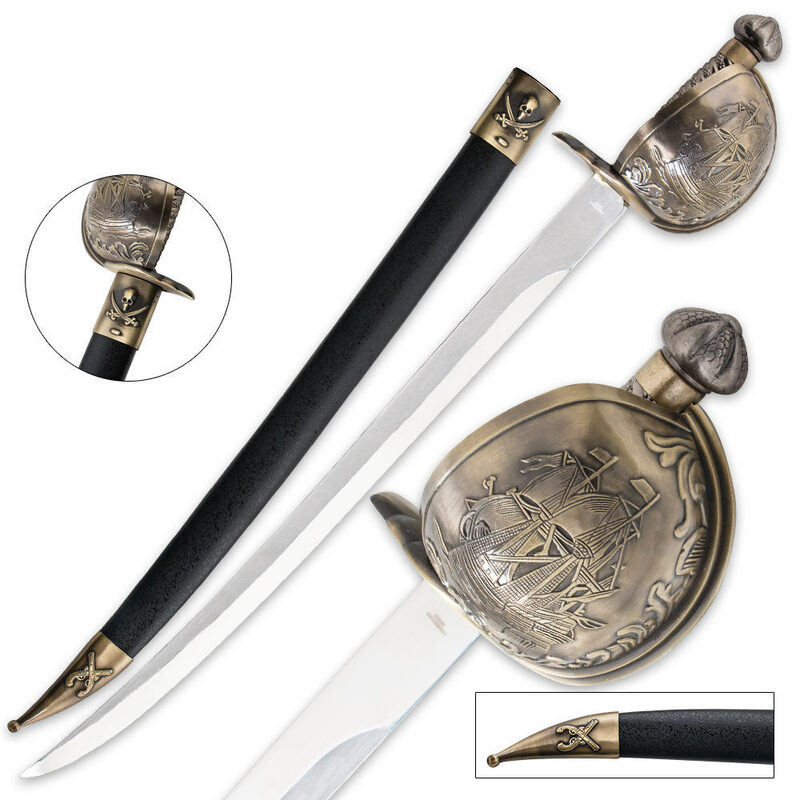 This intricately detailed cutlass has a 22" stainless steel blade with a heavy blood groove. The cup style guard is cast metal bronze plated and adorned with a pirate ship at sea. Skulls, sabers and flintlock pistols accent the cast metal throat and tip of the custom blade sheath. The weapon of choice for high sea adventure or battling scurvy landlubbers! got it right on time. very happy with my purchase. This is a great sword. Let's get negatives out of the way first. The only real issue I had was that the brass end piece on the bottom of the scabbard that has the pistols on it is loose/wobbly. That may need glued someday. The other is that this is cheap Chinese steel, if you care about such things. Other than that, I have no problems. The sword itself is heavy and solid as it should be. The blade does not wiggle at all in the hand piece. The blade is well polished, almost mirror-like and shiny, very attractive, although on both sides near the hand guard the blade has square smudges like there used to be a sticker there. The raised picture of the ship looks nice and its altogether a great sword. It's not razor sharp, but it'd definitely cut something. This isn't Jack Sparrow's sword from the movies, but it's a very nice show piece or for the reasonable price, something to play around with. I would definitely recommend getting, and I'll have a video review on my YouTube up on this sword, channel bfaught17. This is the first sword I've bought from BUDK.Really nice and the detail on the basket guard is great.Very happy with this sword. My sword came with two small dents in the hilt and a lot of scratches on it. It looks like it was beat pretty bad in the hilt. Nice weight. Beautiful blade. Scabbard is very cheap and made of cardboard. The metal skull and crossbones piece of the scabbard came right off. I was expecting a much lighter sword but this one is very nice and almost battle-ready, although I wouldn't recommend reenactment. Heavier and well-built. Blade flexes slightly, as would be expected, and arrived extremely sharp, so be careful. NICE the gaurd is a real nice metal is solid on it nice heavy weight sharp and all very nice the throught and bottom of the sheath are a lil orange like but still really good. metal handle but fills really good gaurd doesnt dig into the hands or knuckels the blade isnt a use blade. i bought it for a desplay peice to top of my collection. very nice sword recomend it to any one looking for a cheapish nice dress pirate cutlass. I purchased this sword for my father for Father's day and both of us couldn't be happier. It arrived 2 days after I ordered it and was of better quality than I expected for a 32.99 sword. Great detail on everything. This was my second purchase from TS and I am very pleased, thank you True Swords. Pretty sure everyone knows it's not really Jack Sparrow's. But it's beautiful nonetheless. Great design, kind of sharp, not as long as I expected, however still a very nice piece to add to any collection. I was overall please with the blade. The blade of the sword itself isn't that shap, it does need a bit of sharpening. It's very highly polished and looks good, but when first recieved it was covered in some sort of sticky residue (i think from the scabbard). Once cleaned it looked much better. but does come back if not cleaned every so often. The hand gaurd is very well done, the ship is done very well and ads a nice touch. Mine did have one or two white spots (i think from when it was fired it overheated, not sure) The scabbard was cracked towards the bottom when it arrived, but not badly. The bottom cover on the scabbard has fallen off once or twice (partly due to the crack, partly due to use). Overall, the sword is nice if kept clean, but the scabbard wasn't that great (although i didn't buy it for the scabbard).